THIS DOLL HAS BEEN SOLD!!!!! 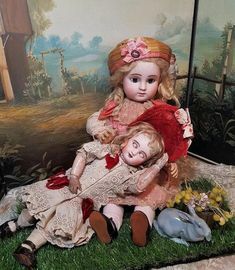 This beautiful, museum quality 12” Simon and Halbig German Fashion antique reproduction porcelain doll was lovingly created by “Millie” winning, world renowned artist, Connie Zink of Land of Oz Dolls. 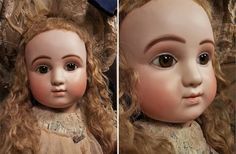 The artistry is superb with wonderfully detailed German eyebrows, beautifully spaced lower eyelashes, mohair upper lashes, carved porcelain teeth, perfectly shaped lips with accents, delicately painted cheeks, and a hint of lavender eye shadow. 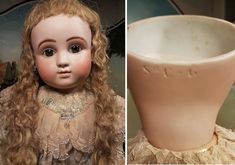 Her porcelain head is on a 9″ composition Bell Collection Lady Body and stands approximately 12″ tall. She has beautiful blue paperweight eyes with lots of depth. She has an auburn mohair upswept wig from Global. This doll is being listed both as a dressed doll and as an undressed doll at this time. She is ready to board the Queen Mary in her beautiful light aqua 1910-1912 walking suit with matching feather and velvet hat designed and made by Lorna Yates of Lorna’s Lovable Dolls . She comes complete with a 100% wool suiting jacket and skirt with brown cut work trim, and chemisette. She also has a cotton half slip, pantalettes, and camisole, along with black leather lady slippers with heels and silk stockings. She is being listed as an undressed doll for $325.00 with a wooden base doll stand. 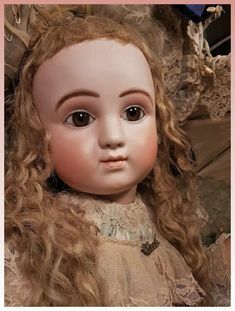 If you are looking to add an exquisite S&H 1159 to your collection of antique reproduction dolls, this may be the one for you. 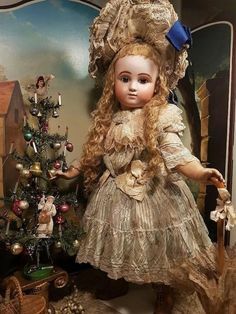 Dressed as shown with complete costume, purse, and doll stand this doll is $450.00. Shipping and insurance to continental U.S is $20.00 by United Parcel Service. International shipping fees will be calculated upon request. My shopping cart buttons do not figure international shipping costs so please contact me at landofozdolls@mchsi.com for a shipping quote.